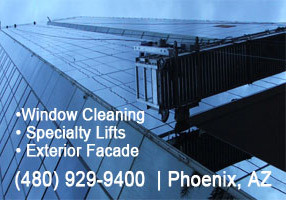 Window Cleaning – Window cleaning has been referred to as the building access business. Although standard window cleaning may be fairly simple, the training and expertise involved in multi-story and high-rise operations are much more technical and complex. VIP utilizes various building access methods: stage platform, rope descent systems, lifts, water-fed poles, ladders and extension poles. 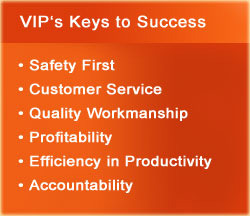 VIP performs commercial and industrial window cleaning, as well as construction site clean-up. Hard Water Removal – Glass is extremely porous and requires substantial care. Building owners often underestimate the amount of regular maintenance required to maintain the pristine appearance of glass walls and windows. Glass that is not cleaned regularly can stain; left untreated, staining can lead to corrosion. The exterior glass and frames of commercial buildings are exposed daily to misdirected sprinkler heads, ultraviolet rays, precast leaching, runoff and oxidation–all of which leave deep embedded deposits that will be baked in by the sun. Routine cleanings WILL NOT remedy the damage, and VIP’s Stain Removal Process must be used to remove pock marks and restore glass and frames. Most companies that provide hard water removal utilize a technique called “acid washing” that typically consists of dangerous acids, such as Hydrofluoric, Hydrochloric, Phosphoric or Muratic to dissolve the mineral build-up. Acids are not only dangerous to humans and the environment, they also dissolve the surface of the glass, causing burns and distortion. High Pressure Washing – VIP offers structural pressure washing for your building façade, stairwells, and awnings, as well as steam pressure washing for sidewalks and parking lots. Pressure washing may restore the look of the exterior fascia of a building without the need for repainting, saving thousands of dollars. VIP Window Cleaning uses the latest in Pressure Washing Technology. We will safely remove dirt, mold and stubborn stains due to atmospheric pollution, bringing new life to your exterior surfaces. VIP specializes in the hard to reach places, utilizing advanced rigging techniques and aerial lifts.